Whovians know how to stay warm. Whovians know a serious scarf when they see it, and this right here is the definition of a 'serious scarf'. This premium knit scarf is over 17 feet long... if that's not serious then we have no clue what is! So, we encourage all Whovians to wrap themselves up in this amazing and officially licensed Fourth Doctor Premium Scarf. Whether the temperature is a little nippy, a lot nippy or even if you just really feel like adding some serious style to your attire, this is the accessory that you need. 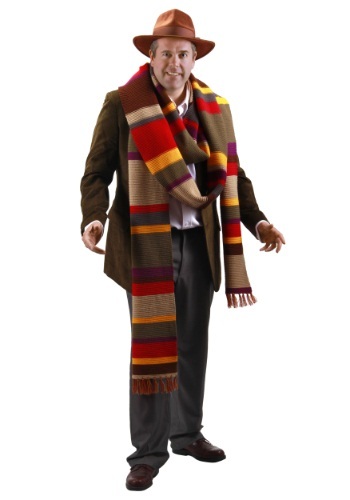 Once you toss this uber long scarfy wharfy around your neck, you'll have the swagger of Tom Baker. It doesn't get much cooler than that...or should we say warmer...? So use this amazing Doctor Who accessory to complete your own Fourth Doctor Costume or to show off your fandom in a subtle manner... although 17 feet may not be so subtle. Wearing a long-long scarf: The 4th Doctor may have allowed his scarf to trail on the floor. Be safe. Avoid tripping. Keep the wrapped loops and fringe off the ground! (I have been a fan of Dr. Who since 1983 when the program first appeared on public TV -- WYES -- in New Orleans.) VROWM-BOOM Vrowm-Boom vrowm-boom vrowm!